Pat Menzies wrote: A sprint Duathlon is about comparable to a 15km-half race in duration and intensity so the effort level you can sustain for that time is what you end up doing. You can be a bit more reckless in the first run portion because there is some actual recovery time in the transition zone and most bike courses will offer areas where you can enhance your recovery on the bike. 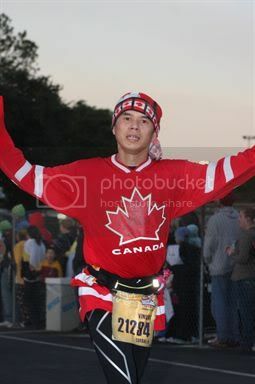 If you actually went "all out" you would be feeling like you just finished a 5km race. So did this work well - or did you leave time on the course? Input was great guys and gals, thanks. I finished just in the top half today (27/59) in my Duathlon debut based solely on the running. My results reflect that I am a newbie cyclist - versus those with similar overall times I made up 7 minutes versus the field in the 7.5K of running and 1 minute in transitions to offset 8 minutes lost in the 20K of cycling. Glad I was not more tentative in the running, and this is thanks largely to the experience shared here. I gave 'er on the runs and it did not impact my cycling speed. Last edited by Double Bellybuster on Wed Apr 03, 2013 8:33 pm, edited 1 time in total. Well done! Where was your race? DougG wrote: Well done! Where was your race? Thanks. Bracebridge. Nice event there. Right on! Hammer time! Shake and bake! eljef-fe wrote: Right on! Hammer time! Shake and bake! So I have my second Duathlon this weekend. This time, the significantly longer run is at the back end - 2.5K Run then 23K bike then 7.5K run. Should this change my approach at all? I am thinking a tempo pace for the first 2.5K versus all out would only give up a minute but save my legs for a stronger 7.5K finishing leg, potentially at the same pace. That one is a bit tougher, but I'd think if you ran it right you'd hit a pace similar to or just below 10k race pace. I did a triathlon last year with an 8k run at the end (2 loops). Since I had ridden the 40k ride so hard (35kph), I took the first loop a bit easy (4:10/k), and hammered out the second loop. I ended up at 3:58/k which is a bit slower than my 10k race pace. I'm planning on using the same strategy this year, since it worked pretty well. I hope this wildly conflicting advice is working out for some positive racing experience. Check out my site, Bamboo Bikes by Pat Menzies, to see and order my handmade bike frames. +1. Good luck and go get some great experience! Pat Menzies wrote: I hope this wildly conflicting advice is working out for some positive racing experience. It is. Compared to a running-only road race, where I know what my final time will be within 1-2% before the gun goes off, I really have no idea what will happen in the Multsport races and just have fun with it. This is certainly the best way to keep that mystery alive. As soon as you start racing smart, you'll be able to know the same thing about a Du as you do about a running race. With allowance for the horrendously measured run courses at a typical Du. My first reaction to Pat's comment was but actually there's a really good point buried in there. For sprint distances, and the OP was originally about a very short sprint distance race, there's much less, if any, need to pace very much if you're in the right shape to race that way. However, multi-sport is just that - you have to look at the race as a whole. Try to approach your races as a single event, not three events, and judge your effort/pace/PE across the whole race based on your level of fitness. Pat's right in the sense that when you get good at that, you will be able to predict your times for these events very closely. It take practice and experience (Jeff's point), but when you get there, racing becomes a little more exciting inasmuch as now you can have a target, and the challenge becomes hitting that target. Pat Menzies wrote: With allowance for the horrendously measured run courses at a typical Du. This is also a very important point. Other than at Ironman, I think every Tri I've been in has not been accurately measured, so take your times with a grain of salt. They do the best they can, but don't have an expectation that they'll be right. Racing by perceived exertion might be a better approach than looking at pace times/splits. Another point to build on what Mark/Pat have said, depending on which Duathlon series you are doing you could have the longer of the two runs either first or last (or maybe they're about the same - every race has their own thing), and that will change your strategy, too. My approach wouldn't be the same for a race featuring a 7.5k end segment as it would in a race with a 2.5k end segment. There's likely going to be much more fading in a 7.5k all out run, than there would be in 2.5k all out run, and that fade would likely produce diminishing returns, hence why'd I'd run the first part conservatively. I've had good results racing smart in longer races, but with shorter races, my best results are from where I raced dumb and put it all out there. A recent 5k from 2 weeks ago comes to mind - I tried to "race smart" and lost. Had I ran as hard as I could without all the other posturing BS I probably would have won. But the result is added to my experience and I don't usually make the same mistake twice in racing. The distance of a race or a leg of a race has nothing to do with fading if you're prepared properly for that race and race it smart. Racing smart and posturing BS sounds a bit like a contradiction. How would this apply to the swim segment of a triathlon? I've read that as a triathlete, my job is to get out of the water with the lowest possible heart rate. I could expend huge amounts of energy in the swim, only to gain a minimal amount of time, due to the physics involved. Contrast that to the Sprint distances mentioned above, where we are talking all out efforts in both (du) so, say all (tri) disciplines. Bottom line, sprint tri, swim all out, or pace myself - call it a "tempo" (moderately hard) effort? Thanks all, appreciate your thoughts. Again, thanks, i appreciate your thoughts. tonyP wrote: I've read... get out of the water with the lowest possible heart rate. Your job is to get out of the water with the lowest possible time. I don't think that spiking HR in the swim is necessarily bad for the rest of the race if you're in good enough shape to recover your HR in T1. In fact, your HR is more likely spike during the run to T1. Of course, if you're not in good enough shape relative to the effort level you put out, all bets are off. I am usually in the minority with dispensed pacing advice, so take this advice in that context. Last edited by दिवंगत on Sun Aug 22, 2010 8:40 am, edited 1 time in total. Yes, it is worth the extra time. I agree with Mark regarding swimming. I've recently noticed my heart rate is in the top 2 zones when I come out of the swim, but that has no effect on the other 2 portions of my race. Even in Ironman, over an hour of swimming hard had little effect on my energy level. Swim hard, it'll be over fast, and you get a minute recovery interval in transition. Double Bellybuster wrote: I am thinking a tempo pace for the first 2.5K versus all out would only give up a minute but save my legs for a stronger 7.5K finishing leg, potentially at the same pace. I ran the opening 2.5K just under my Half Marathon Pace, hoping this would leave me energy for the same pace in the back 7.5K but surely enough for Marathon pace. This seemed to be the right approach, I slowed a bit on the 7.5K to midway between Half and Marathon pace but the this leg was very hilly and I made a wrong turn that lengthened my run. So I think I hit it about right.